The Yarn Spinner Story + Pattern series allows readers who knit (or knitters who read) two pleasures at once: downloadable short fiction and patterns on Ravelry. This is a sweet combination for thinking knitters, particularly ones using a tablet or smartphone. Three Ply, the first Yarn Spinner Story+ Pattern eBook, is now available! 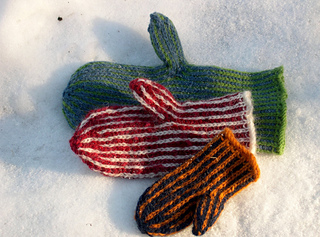 It includes patterns for a hat, mittens and a cowl, and three stories: Riverbend Garden, as well as The Hole Inside and Knitting for Mother Earth. 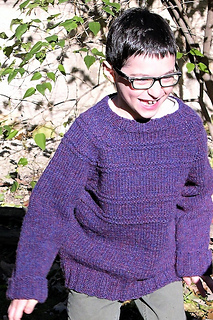 All three patterns are also available individually for download on Ravelry. Riverbend Garden: A Love Story, features a man as he discovers the familiar is not what it seems. Dickie’s mom lived an unremarkable, but lonely life. Yet, she has time for one last story; of a dappled river bend garden, an empty marriage, a widowhood, and a student whose love transforms all boundaries. 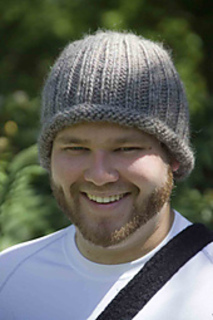 --This story pairs with a hat to fit everyone, from a small child to a man’s XXL. Knitting for Mother Earth catches a young woman on her daily commuter train to New York. She follows her gut, alerting a fellow passenger to what seems dangerous…and, to get beyond the experience, builds a strong bond through knitting. 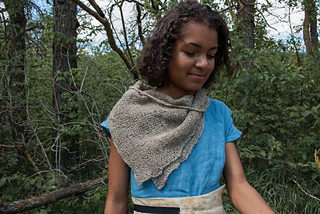 This story pairs with a design for an enormous cowl. Prepare for some sumptuous knitting with super bulky luxury yarn. The Hole Inside, offers unrequited love from an independent heroine who never forgets her knitting. While on a business trip, she’s invited to a knitting group. Settle into a coffee, a town filled with college students, and an unsettling surprise from the heroine’s past that calls for a quick exit.